Chris Anderson has added this forum section for all topics related to antennas and radio transmission. This will be a great place to see which antenna systems work and which dont work so well. You might want to get as much distance as possible out of each flight or just have that extra margin of safety. Maybe your video isn't all that it could be. Antennas are a key element in your drone system and this is the place to share what you use, find out what others are using, bounce ideas around and find solutions. Description: Need range? 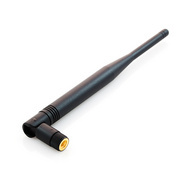 2.4GHz Large Duck Antenna 5dBi with Reverse Polarized - SMA RF connector. Perfect for prototyping with our RF ICs. 50 ohm impedance. 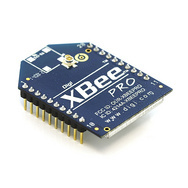 If you are looking for distance, this module combined with a large 2.4GHz antenna is just about the longest range there is. Better performance than the chip antenna because of the ability to add a higher-sensitivity antenna. Like the boat! Probably due to the size of your boat there isn’t much you can do to increase antenna gain there. You could try a clover leaf set up for the 5.8 ghz video where you have one on each end of the transmission. This may help with multipath interference as your transmitter is so close to the water (radio waves diffracted by waves on the water, rocking motion of the boat altering the plane of transmission from the antenna). A clover leaf for the 2.4 x-bee would be too large. So maybe stick with the vertical antenna you have on the boat, and do some improvements on the land side. In a situation where transmitter and receiver are so close to the earth (unlike aircraft) you could greatly increase the range by making the ground station antennas as high as possible. Check into getting a photographic light stand (this is what I use) or similar tripod based stand that would get your GS antennas up to 15 feet or even more. I know this adds complexity to your set up, but if its range you want this could help. Use low loss coax from the antennas to the receivers. Or place the receivers near the antennas on the light stand and use extended data com and video cables to the GS. This is just one solution, I’m sure there are others. Appreciate the input on the clover leaf, I did a radio and TV course 30 years ago but I'm so rusty on antenna's and the like I suppose for the 2.4 Ghz the wave length would require the Clover Leaf too bulky having double the dimensions of its 5.8 Ghz counterpart. I suspect the bulk of the weight on the Duck antenna is the plastic body it may be worth cracking one open see if the active internals can be extracted and re-cased in something lighter. As for the base station I tried the RX and aerial strapped to a hat but the wife won't be seen in public with a man with an antenna on this head :) So a base station is a pretty good option. been kinda slow on here, what are you working on geoffrey?